For some people, Halloween is *all* about the costumes. But for others, it's the perfect time to get creative with your beauty routine. Believe us, makeup is a great way to get in the fright night spirit (see our favorite Youtube tutorials here). 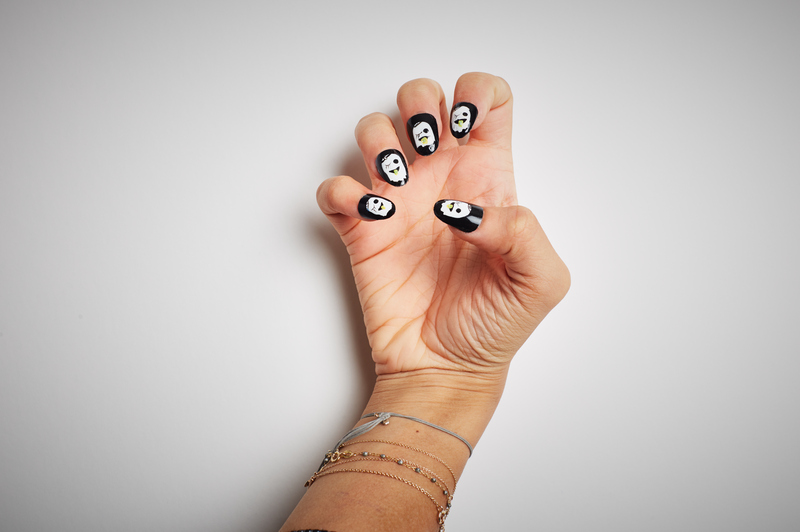 However, if you want to take the less-is-more approach this holiday, then Halloween nails might be the perfect compromise. The one talon trend we're seeing all over Instagram? Ghosts. 1. Apply two coats of SinfulColors Black on Black as a base coat on each nail. 2. Make one stroke straight down the center of the nail with SinfulColors Snow Me White using the brush that comes with the bottle. Wiggle the brush around carefully, distributing the polish to get full coverage. Let it dry. 3. Using the brush from the SinfulColors Black on Black bottle, add polish to the top tip of the nail to detail the bottom of the ghost and add a jagged effect on the bottom of the ghost. 4. Use a liner brush with SinfulColors Black on Black to create a round dot for the open eye. Use the same liner brush to draw thin lines for the winking eye and lashes. 5. Make a crescent for the mouth with the liner brush and then fill in the crescent. 6. Use the same liner brush to draw a thin bow on the ghost’s forehead. 7. Using SinfulColors Yolo Yellow with a liner brush, draw the tongue sticking out. 8. Add SinfulColors Green Ocean with a liner brush on top of the tongue. 9. For a fun effect, paint with SinfulColors Glow in the Dark polish on the white parts of the ghost as a topper. 10. Lastly, add a SinfulColors top coat.